After years of organizing, and most recently through the $15 & Fairness Campaign, we’ve succeeded in bringing important labour law changes to the table. Titled Bill 148 – Fair Workplaces, Better Jobs Act, this proposed legislation aims to raise the minimum wage to $15, ensure equal pay for equal work for part-time, temporary and contract workers, introduce fair scheduling measures, and more. But, we need your help to make sure it passes with the strongest possible amendments. The Standing Committee on Finance and Economic Affairs is reviewing Bill 148 over the summer and is accepting submissions about the Bill until 5:30 p.m. on Friday, July 21, 2017. Together with Parkdale Community Legal Services and the $15 & Fairness Campaign, we have prepared a detailed submission, which you can download by clicking here. We’ve also drafted a sample letter that your organization or network can use to endorse our proposed amendments to Bill 148. Since the Fair Workplaces, Better Jobs Act was first announced, there has been a large backlash by the big business lobby. These corporate interest groups are campaigning against any form of labour law reform, and will be flooding the Committee with submissions that aim to stop or weaken Bill 148. We need you to stand with us to get these important changes for our communities. We need your support to ensure Bill 148 gets strengthened and is passed. Luckily, the broader public is with us! 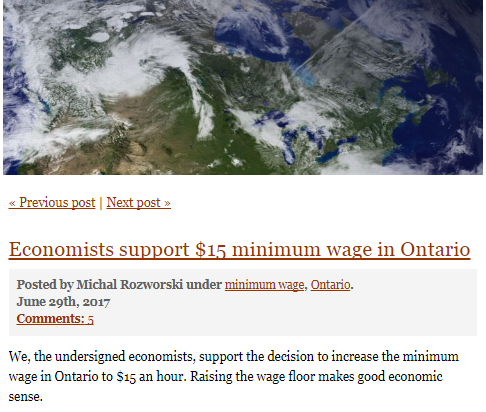 Just last week, 53 prominent economists from across Canada issued an open letter in support of a $15 minimum wage (see their op-ed in the Globe & Mail). Let’s make sure that this support for decent work is also visible to the Standing Committee on Finance and Economic Affairs. Please submit our sample letter to the Committee by July 21, and endorse the amendments we’ve outlined in our submission. If you can copy info@15andfairness.org in your correspondence, that would be of great help. If you need any assistance, don’t hesitate to contact us.